Lawn mower engines require fuel, air and spark in order to sustain combustion. If any of these are in short supply or absent, the engine will not start, or run even if it does. By systematically verifying each of the components are available and working, an operator can quickly troubleshoot a Craftsman lawn mower's engine. Remove the air filter element from the housing and check it for a buildup of dirt and debris. Replace the filter with a new one if it is heavily contaminated with dirt. Otherwise, blow the filter element clean with air and reinstall. Clean the battery terminals and posts when the mower becomes hard to start. The battery location is under the driver's seat, and accessed by lifting the seat on its hinges. Disconnect the negative (black) terminal first by loosening the nut and bolt with wrenches. There is no need to remove the bolt completely, just loosen it enough to slip the terminal off the battery post. Bend the black lead out of the way before removing the positive (red) terminal in the same manner. Brush the battery terminals with a wire brush to clean all the visible crud and corrosion off. This allows a better connection for supplying power to the engine. Once clean, apply a light engine oil (such as WD-40) to the terminals to help prevent future buildup of corrosion. Wire brush the battery terminals and reinstall on the battery posts. Connect the positive terminal first (red) to the positive post (+). Tighten the terminal nut, squeezing the terminal tightly around the post. Connect the negative battery terminal (black) to the negative post (-) in the same manner. Check the condition of the fuel and the fuel filter. Water makes its way into gasoline periodically, either from the gas from a service station, or through condensation when the mower sits for extended periods. If the gas appears cloudy, or contains an excessive amount of bubbles, this is an indication of water contamination. Removing the fuel line at the fuel filter provides a means for draining the fuel from the tank. Inspect the fuel filter. The fuel filter is located in the fuel line next to the engine. It is easily identified by its clear housing, with a small paper element inside. Usually fuel is seen within the filter at all times. 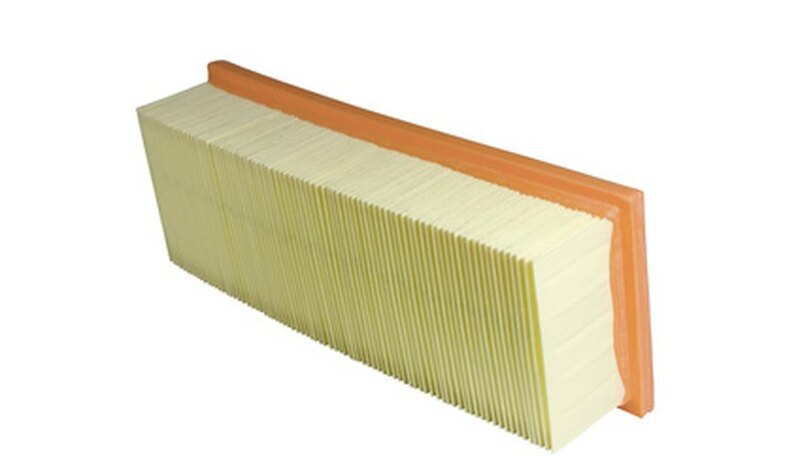 If the filter appears to contain dirt or moisture, remove the filter and replace it with a new one. Squeezing the small clips on either side of the filter allows it to slide out of the fuel line. Pinch off the fuel line coming from the tank with a pair of vice grips, unless the fuel is also being drained and replaced. Insert the new fuel filter into the line. Observe the arrow indicating direction of flow. The arrow must point away from the gas tank, and toward the engine. Slip the ends of the filter into the fuel lines, and adjust the small clips with pliers to retain the filter in place. Refill the mower with fresh gas before starting. Replace the air filter annually. Drain the fuel from the gas tank before storing the lawn mower for the winter season. Avoid spilling fuel onto the ground when working with the fuel line and filter. Keep sparks and open flames away from the mower when working with fuel lines. Damon Hildebrand is a retired U.S. Navy veteran. He has more than 15 years within the oil and gas industry in both technical and managerial positions. Hildebrand has been a technical writer and communicator for the last four years. He is a certified specialists in lubrication and tribology, as well as a certified maintenance and reliability professional.